Tokyo at night, especially on a rainy night, can be a nightmare for an astigmatic like me: lights everywhere, lights reflecting off metal, slick roads, sidewalks and glass. Everything is a blur. Perhaps Kenzo Parfums believes only a YOUNG man can navigate the sprawling, complex landscape of Tokyo, because Tokyo by Kenzo, their latest fragrance release, was created for men 18 to 25 years old. Tokyo by Kenzo’s ingredients were chosen to conjure the colors of nighttime Tokyo: yellow and red lights, the green of trees and plants tucked away in parks and small private gardens, and dark sky and looming empty skyscrapers. Tokyo by Kenzo’s fragrance notes are: (yellow) ginger, lemon, grapefuit; (red) pink pepper, bitter orange; (green) shiso, maté absolute, green tea; and (darkness) guaiac wood, cedar, clove and nutmeg. Tokyo by Kenzo opens with ginger, lemon and a fragrance note that smells like brewed green tea. The green tea note disappears quickly and one has to strain to detect maté. The next stage of Tokyo by Kenzo is mildly “sweaty” (grapefruit, light cedar, shiso); someone, 18-25 years old of course, wearing a citrus scent, has been scurrying about humid Tokyo all day and he needs a shower. 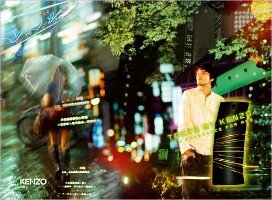 Then, Tokyo by Kenzo fades away, leaving only the lightest trace of lemon on the skin. Tokyo deserves a better tribute scent. Remember in early spring when ‘perfume people’ were so excited about the upcoming men’s late-summer and autumn fragrance releases — even the mainstream releases? None of the new designer scents lived up to their hype; all are rather ordinary and predictable. I was initially put off when Kenzo Parfums announced their new scent was for men much younger than me. How dare they! But now I appreciate the wisdom of Kenzo: only a young man who hasn’t worn many perfumes would find a scintilla of interest in Tokyo by Kenzo. Color-coded fragrance notes and an elaborate ad campaign can’t salvage Tokyo by Kenzo; to me, it’s the blandest of the big 2007 men’s fragrance launches — so far. Tokyo by Kenzo was created by perfumer Marie Salamagne and its bottle, box and layout for press ads was developed by Kashiwa Sato. Tokyo by Kenzo is available in 30, 50 and 100 ml Eau de Toilette and in matching grooming products. Amen to that! I gave Tokyo a try last week and yep, definitely leaves a lot to be desired. A bland spice soup is what it is! My question though is why keep catering to the tastes of the 15-25 set? Kenzo should know better. Reversing the fresh, ozonic, marine, watered-down beyond recognition etc. trend may not be an easy task, but it's worth a shot, no? How was Italy? Do tell! least give me a sample of it. “No!” to both of my requests! So you'll have to tell me what HeWOOD smells like…for some reason I PRAY it was what those people in Padova were wearing. I can dream, can't I? I liked the Tokyo bottle, I thought it was fun, but the fragrance is the snooze you described. It's interesting — I've developed an appreciation for Kenzo's less-is-more aesthetic in a number of their scents (not all), but it's a fine line between subtle and boring. Tokyo is the latter. Maybe this one fell prey to the design-for-the-smell-strip phenomenon. I thought it smelled very nicely gingery on a strip and only started to snooze once I sprayed in on myself. I found this so meh that I thought my nose must be all sniffed out…but it seems that it was just as uninteresting as I thought? Still, the video clip that Robin posted for Tokyo inspired me to order the Broadcast CD, so the scent wasn't a total waste of time! VG: all the ad/add-on elements were good, but not the scent! And the same thing happened to me! I was wandering around the store sniffing the blotter and liking it very much, and so I bought a bottle, and then when I got it home and put it on, I was completely confounded–what I'd remembered smelling was nothing like what was on my skin. It really is a blah, nothing kind of scent. Alas. The only men's Kenzo worth a damn, in my estimation, is Kenzo Jungle for Men. Yummy! A few of the women's scents are also good, but it's really a mixed bag. Kenzo Flower is pretty but dull (the Le Parfum version is worth sniffing, however). Flower Oriental has a wonderful incense note and is quite unisexy. Kenzo Jungle Elephant is a hoot — very strong, femme (big in Brazil) — a mass of spices and heady florals. I've not smelled Jungle Tiger, but I know it has a lot of fans as well. The Kenzo Summer leaf bottles (and I think there are different iterations) are lovely to behold but I can't smell a thing. Actually, I thought since this was geared towards men, maybe I should give it a try? But I see that Erin commented and she didn't like it, so I won't bother. I do have a Kenzo: it's the original perfume (Kenzo: Ça Sent Beau). I find it flowery, heady and unusual. But I'm the only one who seems to like it, as I have NEVER received a comment while wearing it, good or bad. So I wear it for myself, when I'm in the mood. Yeah, oddly enough, I was a little underwhelmed too. To me, it was like a less interesting version of Lucky Number 6 (Claiborne). I really didn't even see that much ginger in it. I love ginger, so that's bad. My favorite Kenzo fragrance is L'Eau Par Kenzo Pour Homme. It smells so citrusy and wet and perfect! But not like the generic kinds of men's fragrances. Actually, it smells a lot more female than male, but whatever. P-C: I came across a soap recently that smelled of rice and sugar and it was pleasant…so I'm very curious about a steamed rice note too…. Yes K, I just checked to make sure: It's just called “Kenzo”. I think it was his first one, actually. But right underneath the “Kenzo”, there is a tag line that reads “Ça sent beau”. It is indeed a bit confusing! But it does smell nice. Just sampled this yesterday, and it's exactly how you described. It's more a “non-scent” than anything else. Disappeared in 2 minutes. I know the Asian market likes their scents subtle, but come on! Jungle L'Elephant is one of my HG fragrances, however…it's divine in the winter! CBG: I MUST get a sniff of that Jungle Elephant scent…so many people love it. Tigerlily: I'd be curious to see how Tokyo's been selling all these months. DO TRY IT ON SKIN before buying…I tried it on paper first and thought it was interesting. On my skin it fell flat.